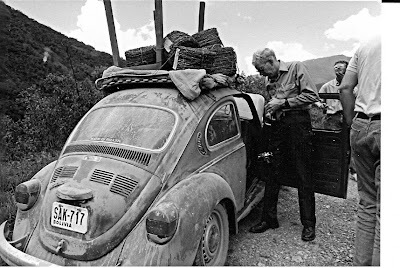 It doesn't seem that long ago that our family plus two men climbed into this laden-down VW bug for a trip from the high hills of La Paz, Bolivia, over the Altiplano down into the Yungus Jungle. From snow to sweat, all in a day, over what is known as the world's most dangerous road. Mind you, Spouse is 6'6" tall. Not sure how he made it into the back seat, but I know he did. He loves to tell how his leg was well bruised from my clenching it as we passed over hairpin turns from heights that I could not believe. At one point we were so high in altitude, the little bug, with all its weight of barb wire fencing being carried on the top, simply quit. We got out to look under the hood and eventually to push for awhile, and that is what this photo is about.